I cannot wait for Thanksgiving, for multiple reasons. For one, it will be our daughters first Holiday! For another I don't have to plan and cook the whole meal for the first time in many years it seems. But with that said I am already brainstorming what I can contribute. Off the bat, I'm crossing my fingers Brian makes his version of the MV Black Dog Clam Chowder, it was SO good last year. I on the other hand, definitely need to make my Pecan Praline Pie à la mode. Maybe also a caramel pumpkin tart. Oh, and souffléd savory bread pudding with sausage, chestnuts and wild mushrooms. And I would love to do caramelized Brussels Sprouts but nobody in my family would eat them except me and Brian. 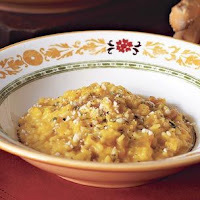 Perhaps Butternut Squash Risotto with sage and pancetta. And in honor of my late Grandmother who always made the most delicious cinnamon sugar muffins at the holidays, I would love to try this recipe I found for cinnamon sugar donut muffins. But I'm sure my family will want me to make popovers. ... My oh my, so many things to decipher from. What is your favorite part of the Thanksgiving meal?